Life is strange and beautiful. The series of events that brought me to one of my favorite possessions is wild, unlikely, largely unclear, and yet at the same time remarkably complex and wonderful. This is a story about a bottle opener. Due to health issues, and in an attempt to improve her overall quality of life, my grandmother left her lifelong home about seven years ago and moved into a nursing home. Let’s fast-forward through unimportant events until last May, when I moved into her house. She was incredibly happy for me to live where she had lived for so long, and to see me make improvements and changes to bring it back up to shape. Little did we know that it would be four months before a serious hospitalization for her, and only six months before her death (I’m still processing everything, but I’m sure I’ll talk about that more in future posts). This house has been in my family since the 1930’s, when my family built it from the ground up with their (figurative and literal) bare hands. My great-grandparents lived here (with their seven children), my grandparents lived here, my mother lived here as a child, and now it is my turn. I recognized the almost poetic aspect to the whole situation from the beginning, but since Grandma’s passing, I feel a very strong connection to this place (I also grew up in the house next door, so nostalgia plays a part, I’m sure). Since then, I’ve been remodeling, cleaning up, making plans, and going through my grandmother’s possessions. What did I say this story was about? Oh yeah, a bottle opener. Let’s get back on topic. In the little drawer next to the sink I found lots of kitchen utensils. Old egg beaters, sifters, and other things you would expect to find in a country kitchen. I also found a rusty bottle opener, which was a little surprising. I was immediately drawn to the object. Almost like Arthur pulling Excalibur from the stone, I reached in, withdrew the bottle opener, and stuck it on top of my fridge for later use. It’s now been there since mid-May, and the relationship that I have formed with it in that period of time is stronger than the connections I have with most of the people I know. I adore this thing. I want to be buried with it. I love the weight of the opener in my hand. I love the way it latches perfectly underneath caps; the feel of the handle as I begin to pry the cap loose; the way that it easily pries the cap off in a satisfying motion. In a world of instability and turmoil, this lovely object is a constant. Still, a mystery remains: where did my grandmother get such a perfect object? Actually, better question: why did my sweet little old grandma, who I never knew to have a sip of beer in her life, have a bottle opener that was undeniably meant for the amber stuff? At first, I didn’t pay much attention to the handle. But one day, I noticed the letters. Printed on the handle, beneath the aged metal and accumulated rust, were the letters “F. & S. Beer” on one side, and “Shamokin, PA” on the other. I had never heard of “F. & S. Beer,” so I went down an internet research rabbit hole. As it turns out, this little opener had roots that stretched back all the way into the 1850s. Eagle Brewing Company was started in 1854, and was open until it became the M. Markel & Company brewery in 1878, then the Phillip H. Fuhrmann Company in 1893, and finally reached its final form as Fuhrmann & Schmidt Brewing Company in 1906. The brewery was located in a tiny Pennsylvania town named Shamokin. 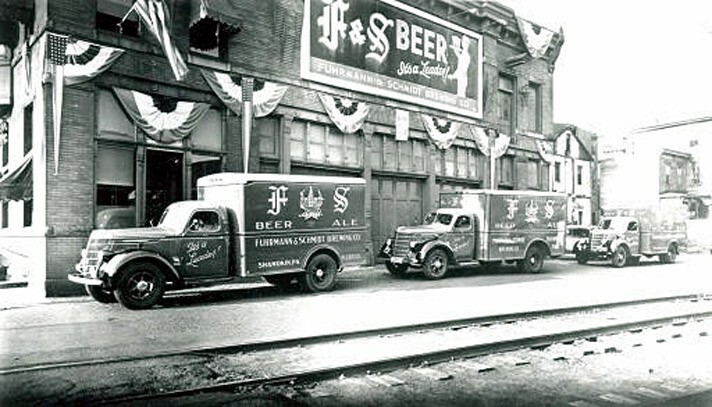 F&S made beer and ale from 1906 until 1920, when prohibition happened. The little brewery that could eventually reopened after prohibition, in 1933, and ran again until 1975, when it shut its doors for good. Apparently, before prohibition, their tagline was “cultivate the habit, drink F&S beer.” Not bad, as far as slogans go. But here’s my point: neither of my grandparents ever lived in Pennsylvania. From the sounds of it, F&S was a local beer, and never really “made it big.” What series of events happened so that this bottle opener made it to them? I don’t have an answer to that. Both my grandfather and grandmother lived in New York for a period of time, and relatively speaking, New York is close to Pennsylvania. Maybe the answer is that simple: they were kind of close, and the delivery truck reached the places where they lived. I have doubts, but it’s possible. Was F&S Beer an old favorite of theirs, perhaps? Maybe it was gifted to them by a friend who knew someone who worked there. That seems more plausible. Personally, I don’t buy either of those explanations. My guess? My mother told me that before leaving New York, her dad got a lot of things from an antique sale, so it’s a decent bet that he picked it up there. But it’s not only worth thinking about how it ended up in their possession in the first place: what did it mean in their lives? They brought it from New York back here, to North Carolina. I wonder how many happy days they used the opener to enjoy a cold beverage on the front porch. I wonder which friends and family gathered for good times and took advantage of its tireless service. And back then, who would have thought that a company started in the 1850s would one day make a bottle opener, which probably got sent to an antique shop, where my grandfather found it, liked it so much he brought it home from New York, used it for decades, and following his death left it in the drawer for me (whom he never knew, due to his death from lung cancer a year before my birth) to find and fall in love with nearly two decades later. Life is funny. Cultivate the habit.